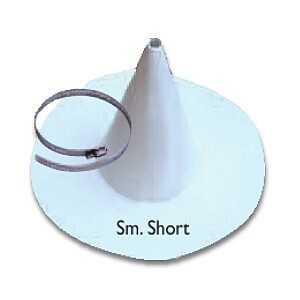 PRODUCT: TPO Small/Short Conical Flashing Boot. Fits 1/2 to 1-1/2 Inch Pipes. 6 Tall, 12 inch OD Round Base. Non-reinforced 0.050 TPO with Stainless Steel Top Clamp. Price/Each. SPECIFY COLOR before adding to cart (GRAY, TAN or WHITE). Shipping leadtime 2-4 business days. Fits 1/2" to 1-1/2" pipe. Prefabricated PVC boot enables quick cut-to-fit in the field and easy installation. 6" skirt (4" is standard). Sizes: 1/2 - 2, 2-1/2 - 4, 5 - 6 inches, Custom sizes.